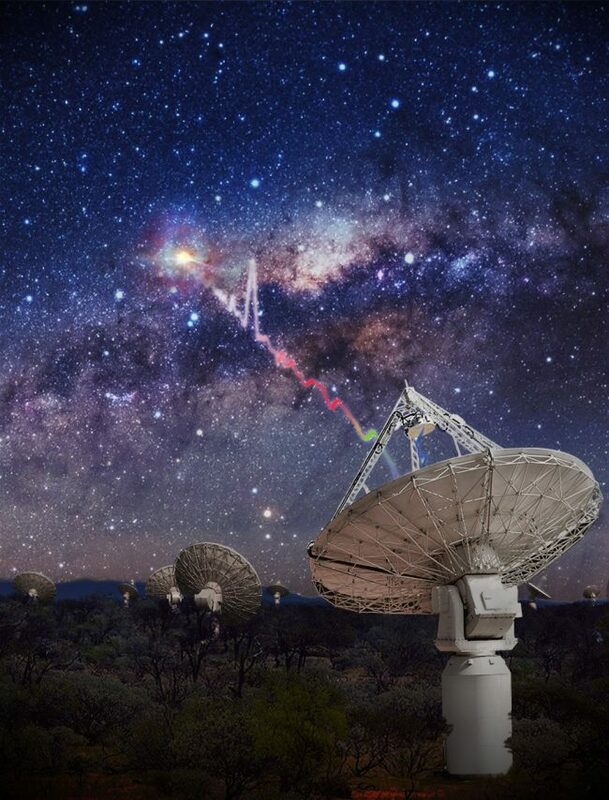 A technological tango between 2 telescopes in the Australian outback has added an important piece to the puzzle of fast radio bursts. Tile 107 – nicknamed the Outlier – is part of the Murchison Widefield Array (MWA), a radiotelescope located in an extremely sparsely populated, flat, semi-arid terrain in Western Australia. The MWA, and another telescope nearby, were used to study fast radio bursts. Image via Pete Wheeler/ICRAR. Here’s a cool story we nearly missed. The International Centre for Radio Astronomy Research (ICRAR) described on October 29, 2018, the way in which two Australian radiotelescopes were synchronized, in order to study the mysterious fast radio bursts. These millisecond-scale bursts have perplexed astronomers ever since the first burst was discovered in 2007. They’re exceptionally bright, and they’re known to come from deep space. Dozens of them have now been found, but no one knows what causes them. 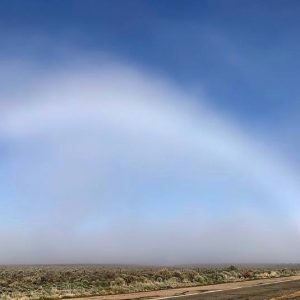 The two telescopes – located side-by-side in the desert of Western Australia’s remote Murchison region – have now shed some light on the mystery, in a new paper published in the peer-reviewed Astrophysical Journal Letters. 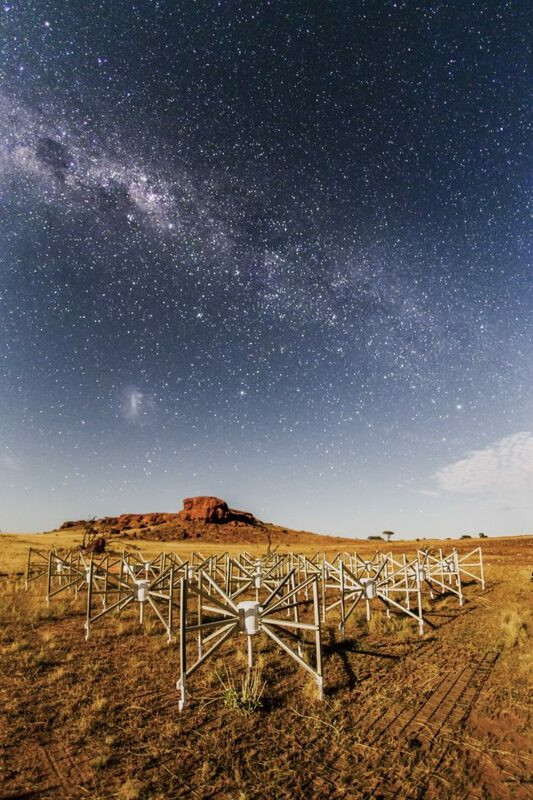 The telescopes are the Murchison Widefield Array (MWA) and the Australian Square Kilometre Array Pathfinder (ASKAP), and they were synchronized to observe the same patch of sky, searching that area for fast radio bursts. And indeed, in the published research, astronomers described how ASKAP did detect several extremely bright fast radio bursts, while the MWA – which scans the sky at lower radio frequencies – did not see anything, even though it was pointed at the same area of sky at the same time. Artist’s concept of the second synchronized telescope, called the ASKAP radiotelescope, detecting a fast radio burst. Scientists don’t know what causes FRBs, but it must involve incredible energy — equivalent to the amount released by the sun in 80 years. Image via OzGrav, Swinburne University of Technology/ICRAR. When ASKAP sees these extremely bright events and the MWA doesn’t, that tells us something really unexpected is going on; either fast radio burst sources don’t emit at low frequencies, or the signals are blocked on their way to Earth. Fast radio bursts are unpredictable, so to catch them when both telescopes are looking in the same direction isn’t easy. It took many months of ASKAP and the MWA co-tracking the same area of sky, ensuring the best overlap of their views possible, to give us the chance at catching some of these enigmatic bursts. The challenge was in making it all happen automatically, but it really paid off. 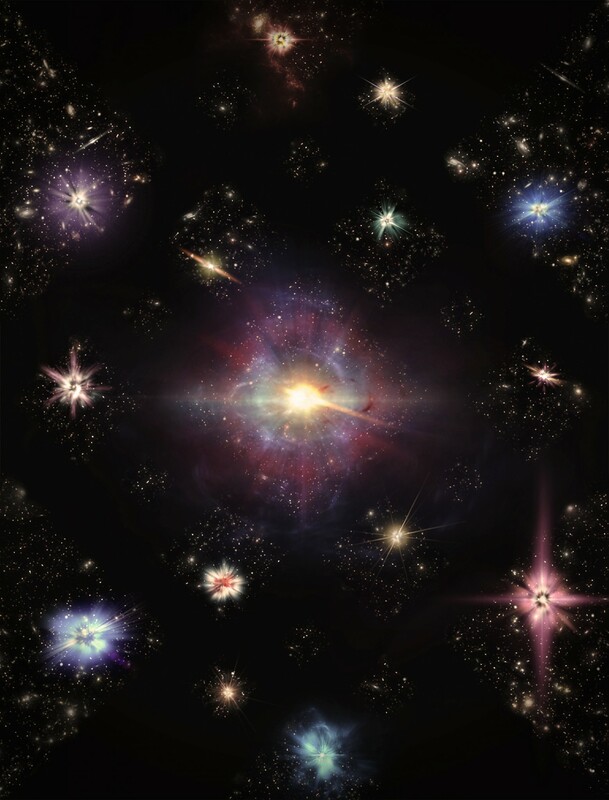 Artist’s concept of fast radio bursts (FRBs). Image via OzGrav, Swinburne University of Technology/ICRAR. It’s really thrilling to have a clue about the origins of these incredible bursts of energy from outside our galaxy. The MWA adds an important piece of the puzzle and it was only made possible with this ‘technological tango’ between the two telescopes. It’s an exciting development because it unites the two teams and it brings home the advantage of having the two telescopes at the same site. 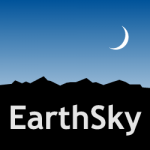 Future coordination between the teams will also benefit other areas of astronomy, as complementary views from the two telescopes can provide a more complete picture of a situation. Bottom line: Two telescopes in Australia were used to search the same patch of sky for fast radio bursts. One telescope saw them; the other didn’t, despite the fact that both were looking in the same place at the same time. This result sets some parameters on what might be causing the bursts and so sheds light on the mystery.